ARMN volunteer Noreen Hannigan describes efforts to restore Arlington Central Library’s native-plant gardens, a legacy of the late Lynn Kristianson. Visitors to Arlington’s Central Library may have noticed a work in progress taking place around the rear and side entrances—restoring native-plant pollinator gardens created by a kindred spirit who sadly passed away. A few years ago, library employee Lynn Kristianson created and maintained native-plant beds for pollinators along the rear and sides of the building. Lynn had a Masters degree in microbiology and was a native-plant enthusiast. With the library’s permission, she bought plants with her own money and tended the gardens on her own time. Lynn planted an impressive variety of flowers, including sundrops, liatris, hyssop, mountain mint, columbine, buttonbush, New York ironweed, spiderwort, and many others. Lynn even placed signs around the gardens with the names of each native plant. Lynn and her husband were also recreational bicyclists. In February 2014, Lynn was cycling on a country road and was struck by a hit-and-run driver. She was seriously injured and struggled to recover, but unfortunately died in June 2015. After Lynn’s accident, the library staff did its best to keep the weeds back but were unable to work in the garden on a regular schedule. The invasive plants had their way in the end and the signage became weathered and faded. 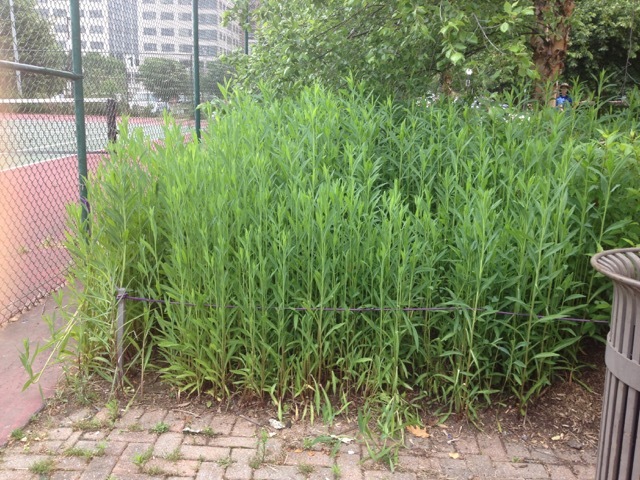 ARMN member Yu-Hsin Hsu was leaving the library one day and saw a library employee frantically pulling weeds. 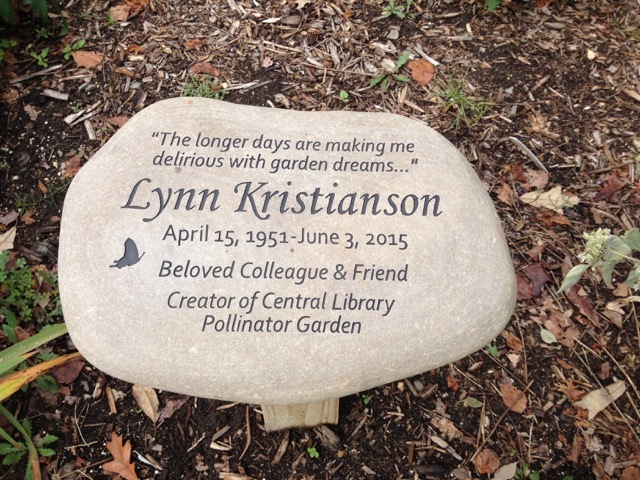 Yu-Hsin talked to her and learned that the library was trying to clean up the garden in time to hold a dedication ceremony in Lynn’s memory. Although not an experienced gardener, Yu-Hsin jumped in and started helping. She returned every week, rain or shine, to work on the weeds. A few weeks later, I joined in on the effort. The library held its memorial ceremony in June 2016, placing a plaque to Lynn’s memory. ARMN has now adopted “Lynn’s Garden” as a service project with the hope of keeping Lynn’s good work going. Lynn’s husband Gordon, a retired construction manager, later designed and installed a lovely pergola in the sunny part of the garden. We envision it covered in coral honeysuckle next summer. In addition to the groundcover weeds, one plant in particular, a kind of aster called Boltonia asteroides, had seeded itself aggressively and was growing in thick clumps throughout the garden. Although a native itself, it overtook many of the other native plants. So, the decision was made to remove the Boltonia. In its place were vestiges of Lynn’s natives that, happily, came back as spring and summer wore on. 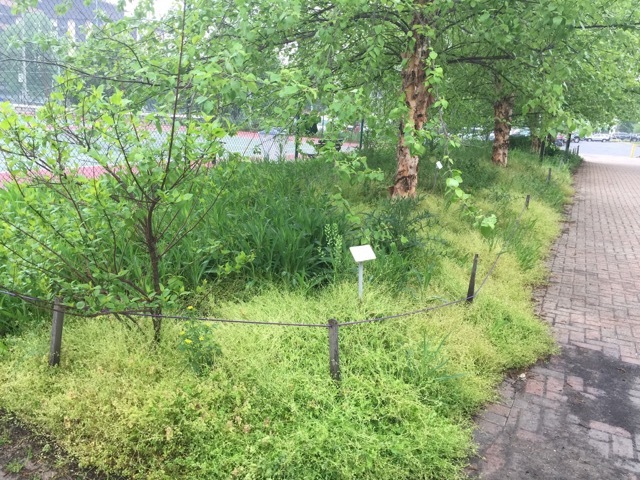 Another challenge was remedying the conditions around the line of four river birch trees planted in the library’s berm garden. The trees are mature and beautiful, but they are surrounded by pavement on all sides and the soil is very hard, dry, and rocky. They experienced some significant leaf drop during the hot spells, but the library has allowed us to use the outdoor faucets for watering. Now we are looking for ways to spruce up the berm garden without impacting the birch trees. There is much work yet to be done. We will have periodic volunteer work parties to bring Lynn’s Garden back to the way it was when she was alive. 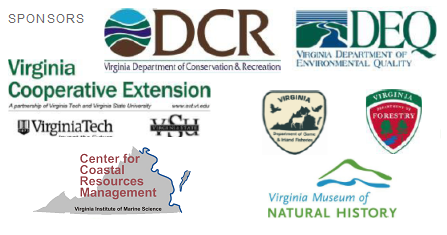 Check the Volunteer tab on the homepage of this website for updates. If you have a few hours here and there, we’d love to see you there. Thank you for doing this, Noreen. Lynn was a dear friend of mine and I think of her often. My son did his Eagle Scout project with her at this garden, creating signs to label the plants. I am grateful that you are carrying on Lynn’s memory. She was very proud of that garden!